As a member of the Kelloggers Network, I was sent a couple of boxes of Rice Krispies and decorations to create some festive edibles such as ornaments. I decided to try something different and attempted a gingerbread house of sorts. As you can see, the structural stability of said house remains questionable. In hindsight, I should have allowed the roof to harden a bit more before placing on the walls of the house. The lack of architectural planning resulted in immediate consumption, much to my dismay. Participating in Wordless Wednesday this week? Link up your post below. Very creative! I bet it tastes delicious too! Interesting idea... hope you enjoyed the feast!! What a cool activity to do with kids. Yummy too. I haven't made anything yet, I need more time in my days! Hah! 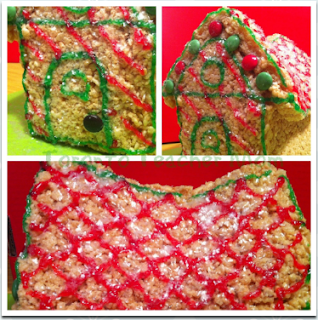 Good try at any rate - I cannot imagine it would be EASY in any sort of way to create a Krispie house! I am impressed it looks as great as it does! You certainly did a great job! The gingerbread house looks so beautiful and of course yummy! :) Thanks for hosting. That's pretty detailed. Good job on the piping. Those are awesome - very impressive. wow! works of edible art!! I'd much prefer that over a regular gingerbread house, THIS one I'd happily eat! Oh my gosh! What a great idea! The question is, will the house be eaten? Sorry, for my tardiness with my comments this week. Thanks for linking up with me this week. Hope to see you again next week.